This is a copy of the introduction to Homicide and Violent Crime, edited by Mathieu Deflem. Bingley, UK: Emerald Publishing, 2018. Please cite as: Deflem, Mathieu. 2018. "Introduction: Studying Violence and Killing." Pp. 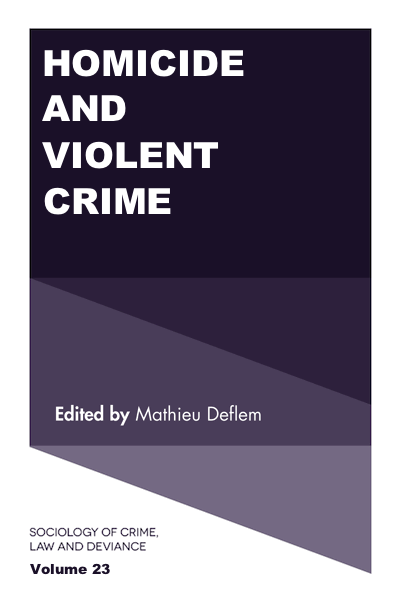 1-3 in Homicide and Violent Crime, edited by Mathieu Deflem. Bingley, UK: Emerald Publishing. The archetypical representation of the criminal in the 19th century, and for centuries before, was that of the violent offender who was lacking in civilization, humanity, and intelligence. From at least the 19th century onwards, this criminological image was replaced by that of the cunningly intelligent modern criminal who took advantage, better than the police had done as one official once expressed, of the new means and opportunities afforded by various technological advances (Deflem, 2002; Pasquino, 1991). In the development of the criminological sciences this transformation is reflected in the move from a pre-occupation with the anomalies of the body, exemplarily expressed in the work of Cesare Lombroso, towards the opportunities offered in and the pressures exerted by various social conditions that produced deviant and criminal behavior as its normal or rational outcome. Briefly stated, one might expect today that violent crime and homicide should largely be a thing of the past. But this is not the case. We are not, it would seem, quite as civilized as we all too routinely think we are. Or, more precisely stated, civilization and more and less lethal forms of violence are indeed not necessarily the antagonists we like to and often do presume (Rojas, 2002). This volume in the series Sociology of Crime, Law and Deviance is devoted to the social-scientific study of violence and homicide, not only because of the peculiar stubbornness of these offenses in contemporary times, but even more sharply so because a multitude of incidents of violence and killing, simply stated and striking to observe, are often in the news. Ranging from concerns over accusations of domestic abuse to killings in our cities and across the world, violent crime and homicide have stayed with us, not as mere remnants of a past we cannot shake, but as expressions of certain dynamics and strains of our world of today. The chapters in this volume tackle some of these important issues and questions with a variety of theoretical frameworks and methodological tools as applied to a number of relevant offenses. In Part I of this volume, chapters are collected concerning the role of family and gender. Melissa J. Tetzlaff-Bemiller focuses her chapter on the dramatic concept and reality of child murder. Using statistical data, she shows the value of a more proper and methodical study of the killing of children that can allow for more adequate relevant criminal policies. Denise Paquette Boots and co-authors examine the Dallas Domestic Violence Task Force about the response to domestic violence. They highlight the findings of the project and detail its policy recommendations. In a third and final chapter concerning family and gender issues, Alesa Liles and Stacy Moak argue that theory and intervention suggestions on offending have to be gender specific to account for the role of women. The authors derive their conclusions on the basis of an examination of historical research on female offending. Part II pays attention to a variety of institutions and identity aspects in matters concerning violent crime. Danielle Sutton relies on the work of classical sociologist Emile Durkheim to analyze dynamics of the Manson Family as a quasi-religious group. The chapter thus contributes to discussing religion as an appropriate framework for our understanding of violence. In a chapter on the deterrence and mitigation for campus violence, Daniel Adrian Doss studies violence on college campuses from a phenomenological framework. The author suggests ways to develop preventive and control strategies towards the establishment of a lasting campus safety. Kayla Allison discusses serious forms of bias violence on the basis of Identity Fusion Theory. Focused on the Charleston church shooting, the author shows the value of using publicly available sources for the use of social-psychological theories that can be applied to the study of discriminatory violence. Centered on the role of police and other state institutions, Part III of this volume begins with a chapter by Wendy Regoeczi concerning the conditions of evidence examining and explanation trends in homicide clearances. She specifically examines the level of support for existing explanatory frameworks of why some criminal killings are more likely to be solved than others. Malcolm D. Holmes’s chapter examines the pressing problems of police violence involving minority citizens in the United States. The research shows that the incidence of police violence is higher in segregated minority neighborhoods. Seeking to account for the effect of police on violence, Paige Vaughn formulates a multi-level theory to account for how police typically respond to incidents of violence. This perspective reveals how police not responding to violence and the institution not being perceived as legitimate will affect violent offending. James Pratt extends the perspective to problematize the notion of the American Dream and its role in institutional anomie theory. Pratt argues that one must critically engage with the United States’ legacy of racial violence and racialized social conditioning. In the final part of this book, global and comparative dimensions are reflected upon to expand, usefully, beyond the borders of the United States. Studying international trends of homicide, co-authors Mateus Rennó Santos and Alexander Testa review the relevant literature on the basis of data from the World Health Organization. The authors reveal a general but uneven drop in homicide across the globe, which they attribute to factors beyond local phenomena. Co-authors Claire Chabot and Marc Ouimet analyze 145 countries of the world and argue that especially impoverished countries have relatively high homicide rates. Indeed, the authors argue that economic determinants, especially inequality, but also formal mechanisms of social control as dependent on poverty and wealth, are important factors to consider. In the final chapter of this volume, Ericka Adams and Claudio Vera Sanchez study homicide in the country of Trinidad and Tobago. They find homicide concentrated among young men of African descent who live in underprivileged and demographically dense communities. Taking the various chapters of this book as a whole, then, the authors make a useful contribution to the social-scientific study of violent crime and homicide in our world today. In this sense, the authors respond collectively and individually to take seriously the need to examine the conditions, causes, and consequences of some of the most problematic behaviors in, not despite of, the age of modernity. The chapters presented here are hoped to thoughtfully contribute to unravel some of the reasons why violence and homicide have until today persisted in various forms and manifestations. Deflem, M. (2002). Technology and the internationalization of policing: A comparative-historical perspective. Justice Quarterly, 19(3), 453-475. Rojas, C. (2002). Civilization and violence: Regimes of representation in nineteenth-century Colombia. Minneapolis, MN: University of Minnesota Press. See the Table of Contents of this book and publication info.